I would never be so bold as to declare any one Simpsons quote the funniest of the lot. With 25 seasons (and about 10 good ones) it’d be impossible to allocate inarguable superlatives to a single line, moment, character, or even episode. But even if candidates for all-time favorites are perpetually up in the air, there are a dozen or so instances from the prolific series that stick with me consistently. Quotes and gags that pop into my head multiple times a week, sometimes with only the slightest provocation, diverting brain power from the legion of more important things I might be wise to pay more attention to. A few of these examples aren’t even especially funny (at least not in comparison to some other gems from the show), but have for some reason found a comfortable home just beneath my conscious thought. 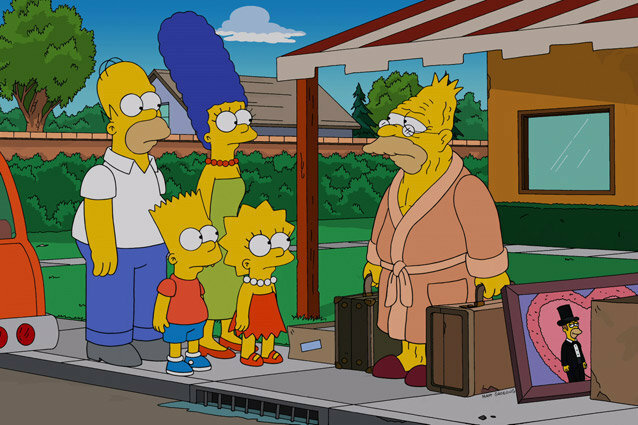 In celebration of The Simpsons‘ imminent arrival in our lives in two whole new ways — in its first full-series marathon on FXX, and in its pioneer journey to digital distribution (via EW) — I couldn’t resist paying tribute to these moments back upon these neurological leeches from one of my favorite TV series. Please chime in with your own! Context: Strikebreaker Abe begins reminiscing on the good old days during a meeting with business mogul Monty Burns. Eventually, his rambling takes him to the above quote about the alleged mid-20th century colloquialism for American currency. Pops into my head whenever: Someone asks me to make change. Context: Juvenile delinquent Nelson introduces Bart to his father’s prized possession. Pops into my head whenever: I see a car. Seriously. Any car. Pops into my head whenever: There’s a lull in conversation aching for placeholder smalltalk. 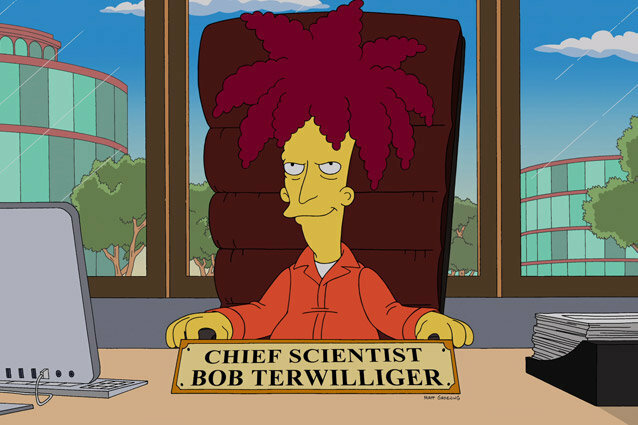 Context: After an ostensibly romantic musical montage, Sideshow Bob reveals his true intentions behind marrying Marge’s sister Selma Bouvier: he aims to kill her! Pops into my head whenever: I hear a Frank Sinatra song. Context: An ether-induced Mr. Burns ostensibly drills a hole into the brain of perpetually unfortunate Hans Moleman. Pops into my head whenever: Anything causes me duress or anxiety (which, if you know me, you know is no rare occurrence). Context: After procuring a cherished ringtone (Bart groaning in sorrow) for his “brand new cell phone,” Skinner brags about the lack of wires weighing the phone down… before pulling out the one necessary, and particularly bulky, cord. Pops into my head whenever: I hear somebody discussing cell phones. Context: Bart mocks Lisa for her stint in detention via Springfield Elementary’s new academic regime (under which he is thriving), highlighting the unusual turn of events for the siblings… or trying to. Pops into my head whenever: Anything unexpected happens. This is the perfect example of a quote that isn’t outrageously funny but that has proved itself a resilient go-to quote, due largely to its simplicity (and all-purpose nature). Context: Prompted by Marge, Homer asks Milhouse where the conspicuously absent Bart might be… but Homer doesn’t bother leaving his seat at the kitchen table, he simply shouts out the window across the alley to get his answer. 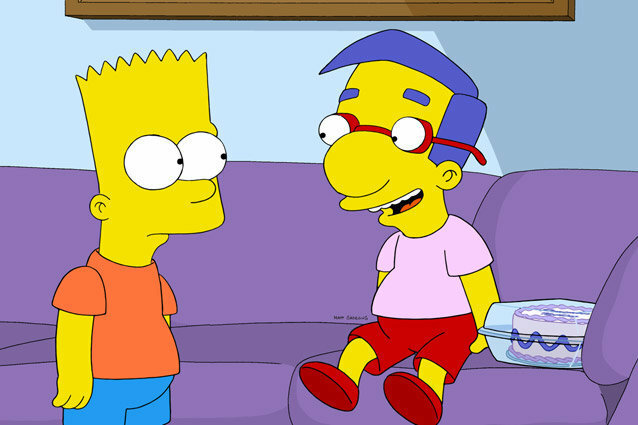 Upon hearing that Bart is over at Nelson’s place, he has one last question for Milhouse. Pops into my head whenever: Anyone I know mentions an unfamiliar name. Context: Homer aims to teach his father how to woo Marge’s mother, bestowing his lessons of “cool” through the means of a funky little ditty. Context: Milhouse is bemoaning Bart’s troublesome dog Santa’s Little Helper. He accuses Bart of lying for the pup when he allegedly ate Milhouse’s goldfish, a crime that Bart attempted to cover up by trying to convince Milhouse he never had a goldfish. Pops into my head whenever: Honestly, there is no organic trigger for this. I just think about it a lot. Context: Homer tries to write legitimately prescient fortune cookie fortunes. This is one of them. Pops into my head whenever: I open a fortune cookie. Pops into my head whenever: Anyone asks my endorsement on any plan, significant or menial. Context: Prolific actor McClure performs the final scene of the hit musical, Stop the Planet of the Apes, I Want to Get Off! Pops into my head whenever: Anyone mentions the original Planet of the Apes, any Planet of the Apes apes follow-up feature, apes, chimpanzees, the alphabet, hatred, Broadway musicals, music in general, The Simpsons, television, or most other things. Few contributions to the English language have affected my life so prominently.